When old Metalheads like me stop and think about how Metal evolved in Norway and other Nordic countries of Europe in the last 20 years, we become truly amazed: since the 90’s, they’re ruling the world in terms of new names. Now, it’s time for a new name that comes from Oslo: BLACK VIPER, a quartet that is releasing their first album, “Hellions of Fire”. They’re a young band that follows the trend of Old School Heavy Metal. To be more specific, they’re a traditional Heavy Metal band with many influences from NWOBHM and earlier North American Speed/Power Metal bands as AGENT STEEL and ABATTOIR (that, by the way, had a strong influence from JUDAS PRIEST). Of course it’s not something new, but it’s truly good, done with fine melodies and a very good technique. The sound quality, once more, is not as good as it could be due the illusion that you can’t breed something organic with modern sound technologies. And their album is trying to be as those in the past, a sin committed against their own work. It’s clean and heavy, but it could be better than is presented here. It’s raw beyond the needed. And it’s not something that we can’t understand, but it can’t put out all their musical possibilities. Musically, they’re on the right path. “Intro/Hellions of Fire” is filled with a great work from guitars and has a strong and bold energy, as it presented on “Metal Blitzkrieg” as well (here we can hear a very good work on vocals), the fast and melodic insight of “Storming With Vengeance” (great guitars, indeed), the charming melodies on the fast “Suspiria”, and the very good work from bass guitar and drums on the sharp and furious “Nightmare Mausoleum (The Sleeper Must Awaken)” are the best ones from the album, but all the songs are very good. 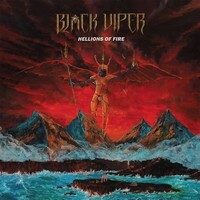 “Hellions of Fire” is truly a good album, as BLACK VIPER has talent and potential. A better sound quality, and polish the vocals (the high pitched screams are good, but the excess of them is a boring thing, but the vocalist has a very good voice, I must state), all will be fine.